The LPC1788 is a Cortex-M3 microcontroller for embedded applications featuring a high level of integration and low power consumption at frequencies of 120 MHz. Features include 512 kB of flash memory, 96 kB of data memory, Ethernet, USB 2.0 Host/OTG/Device , 8-channel DMA controller, 5 UARTs, 2 CAN channels, 3 SSP/SPI, 3 I2C, I2S, 8-channel 12-bit ADC, 10-bit DAC, QEI, LCD controller, SD/MMC interface, motor control PWM, 4 general purpose timers, 6-output general purpose PWM, ultra-low power Real-Time Clock with separate battery supply, and up to 165 general purpose I/O pins. The HY-LPC1788-CORE Board features an LPC1788 controller, JTAG, an USB Device, onboard power supply and all the input output pins taken out via a 2.00mm standard Berg Connectivity. 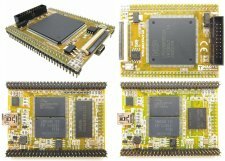 HY-LPC1788-CORE Board can be used as a general controller board for various designs and different connectivity options. The sample source code, schematic, software and tools are provided along with the board using which you can start with your application development. The HY-LPC1788-CORE Board has a 20 pin Wiggler-compatible JTAG interface which can be used for debugging/programming. The board can be debugged/programmed using parallel JTAG and CoiNel USB JTAG. You can also program the board via UART0 by the use of a simple TTL to RS232 converter. Parallel JTAG and TTL to RS232 converters are part of the package. JTAG connector ( 2*10 pin 2.00mm ) for programming/debugging with ARM-JTAG. The board has access to allmost all pins for external connection. The pins are named according to the interfaces where ever possible. All pins are available via standard 2.00mm Berg Strip. On Board USB Device. This is a perfect solution for developing USB Peripherals. On Board Mini USB ( USB Device ) Power Supply with Power Supply LED. 32.768 kHz crystal for Real Time Clock. Board Dimensions: 60 * 45 mm. - 4.3" LCD Module with resolution 480 x 272 pixels, HY43-LCD, recommend the whole package in here. - 5" LCD Module with resolution 480 x 272 pixels, HY5-LCD, recommend the whole package in here. - 5" LCD Module with resolution 800 x 480 pixels, HY5-LCD-HD, recommend the whole package in here. - 7" LCD Module with resolution 800 x 480 pixels, HY7-LCD, recommend the whole package in here.